P Traps and S Traps. What Letter is Your Sink’s Trap? 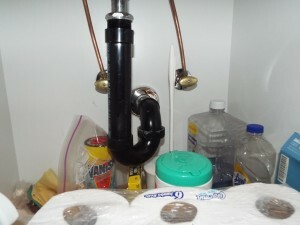 Plumbing – What Letter is Your Sink’s Trap? Inspectors are required to look high and low. At the obvious and the subtle. In NJ we are required to follow the American Society of Home Inspectors (ASHI) Standard of Practice. Within the plumbing section we are required to describe the systems and components that are part of the house’s plumbing. This includes the supply pipe material, drain and waste pipe material, location of the main shut off and more. This article will look specifically at the drainage pipes and more to the point, the trap, under the sink. When water exists any sink, kitchen, bathroom, laundry, bar, etc. it makes its way toward the sewer or septic system. The obvious purpose of the drain pipe system is to route the water, without leaking, out of the house. Within the drain pipe system is the TRAP. This is the little loop directly below the sink usually seen from inside the cabinet below. While a secondary benefit of the trap may be to trap your wedding ring when it falls off when you are doing the dishes but in fact, the primary purpose of the trap is a safety device. Sewage gasses are created as the waste matter decomposes. Just like a garbage dump generates methane gas that has to be vented, the sewer or septic system creates methane gas and unless it is kept from rising through the drain and waste plumbing, it will enter the house. Methane gas is flammable so therefore it is dangerous. The trap facilitates the creation and maintains a water-plug that prevents these unwanted gasses from entering the house. That is the absolute primary purpose of the trap, to hold the water plug. If it also saves your marriage, that’s a side benefit. The trap works because there is usually a vent pipe next to it. The vent pipes are part of the piping systems that you can often see penetrating the roof of a house. The open vent above the roof helps water drain properly and helps create the water trap. What Type of Trap Do I Have? Most sinks have a “P” trap below it and then, in most applications, behind the wall is a vertical vent pipe that goes up through the roof as well as the pipe that goes down that carries the water. The typical P trap looks like a P if you envision the flat section of the letter P horizontally. Take the letter P and turn it 90 degrees clockwise. The P trap in conjunction with the vent ensures that enough water will remain behind to ensure the water plug does its job. Occasionally the plumbing under a sink is an “S” trap. 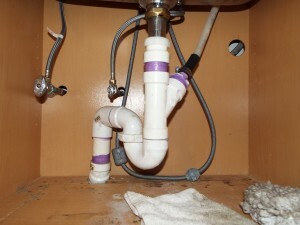 This is when the drain from the sink comes down a few inches, loops back up then loops back down. See the accompanying photos. P traps are good. S traps are bad. Example of a P trap. Why are S Traps Bad and how can it be fixed? S traps are bad because they present the potential for water from the sink creating a siphon and as the water empties, once the water starts flowing, without a vent, the last few inches of water don’t know that they have to be the water plug and gravity and the force of the emptying water carries all of the water out of the S trap. There is no water plug and gasses can enter the house. If you’re merely running the faucet a water plug will probably be maintained. However if you ever fill the sink and pull the stopper, there’s a lot of force and a siphon can be created so that the last bit of water follows the water molecules in front and nature’s course is for every drop of water to follow the one before it and the last ones never get the message to stop and become the water plug. Plumbers can now use Air Admittance Valves (AAV) where an S trap exists. This can be an inexpensive fix to a potentially harmful condition. The AAV is a mechanical, one way valve that can let air in behind the water to ensure that the water plug remains and when there isn’t water draining, it closes to prevent gasses from entering the house. 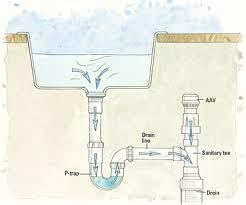 Diagram of a drain and trap with an Air Admittance Valve (AAV). Regular P traps are most common and provide a valuable function. S traps are an issue on a home inspection but rest assured that there is a fix that shouldn’t deter you from buying the home you are considering.